Students had extraordinary access to a range of professionals, including financial analysts and marketing personnel at the Art Institute of Chicago, partners at Taft Stettinius & Hollister law firm, and human resources managers at the Hilton Palmer House Hotel, among others. 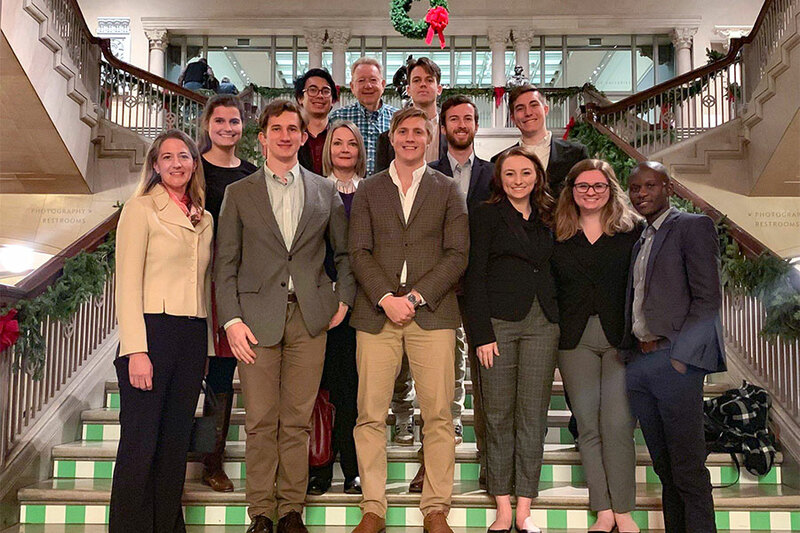 One evening, the group met over dinner with local Christian Science business professionals, including several Principia alums, at Seventeenth Church of Christ, Scientist, in downtown Chicago. Graham Grady, a partner at Taft Stettinius & Hollister, holds a special regard for Principia after speaking at the College’s 2015 Commencement. He spent several hours sharing insights with the students about his law practice, which focuses on land development in the Chicago metropolitan area. He also encouraged the group to use their Principia education for good in the world and described his own community involvement as director of the Lloyd Fry Foundation, which fosters learning and innovation in low-income communities across the city. In addition, Grady is founder and former chair of the African American Legacy, a compendium of volunteers who partner with the Chicago Community Trust to support education, afterschool, and mentorship programs. Throughout the trip, students relished Chicago’s big-city vibe, enjoying gorgeous views and a visit to Cloud Gate (the public sculpture commonly known as “The Bean”), an “insider” tour led by a staff member at the Art Institute, and a scavenger hunt along Michigan Avenue.